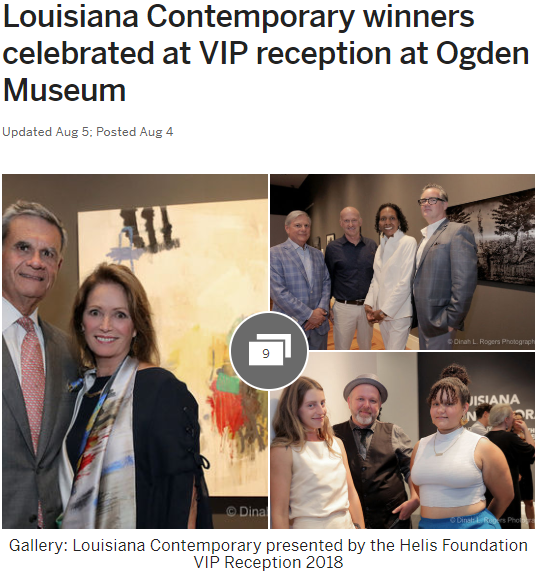 The call went out across the state, and hundreds of artists answered to enter Louisiana Contemporary presented by the Helis Foundation. This juried art show at the Ogden Museum of Southern Art in New Orleans features works by artists living and working in the state, with entries from New Orleans, Lake Charles, Shreveport, Monroe, Lafayette and other cities and towns. This year’s juror was Courtney Martin. She’s the deputy director and chief curator at the Dia Art Foundation. Third place — Rhenda Saporito of Metairie, Got GPS, Fore, 2017, mixed media on canvas. The exhibition also includes works by Renee Allie, Craig Berthold, Bradley Bowers, Katie Clark, Anita Cooke, Dean Dablow, Marianne Desmarais, Cat Gambel, Mitchell Gaudet, Erfan Ghiasi, Ryan Gianelloni, Southerly Gold, Marcia Holmes, Lena Kolb, Justin Lundgren, Esther Murphy, Jack Niven, Alex Podesta, Laurel Porcari, Matthew Shain and Nell Tilton. It opens during Hancock Whitney White Linen Night on Saturday.